Willow Springs … a Family Farm » Blog Archive » Where Has the Summer Gone? Can you believe it’s August already? How did that happen? This is the first year that I don’t have to shop for school supplies or clothes, I’m not sure how I feel about that. Of course I’m glad that I don’t have to spend all that money, but my babies are all grown up. It’s going to be strange seeing the the buses and kids out and about and not be a part of it. Before you know it, it will be Fall and the leaves will be changing. With Fall comes football! I like college the best, but watch NFL if the right teams are playing. Yes, I live in Ohio. No, I’m not a Buckeye fan. With all that has happened to OSU this year, I wonder how they’ll do this year. Who will be the best team in the Big 10? I think Nebraska might have a shot. How weird is it that Nebraska is now a part of the Big 10 now? Since Michigan hasn’t been doing very well for a while, I might have to root for Nebraska. Another thing that happens in the Fall is my new favorite holiday…..Halloween! Halloween was always fun when I was growing up, but I never really got in to it as an adult. That all changed the first time I went to Ghoultide with my sister! 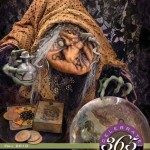 My sister, Connie Porcher, publishes the magazine Celebrate 365. She features a lot of the folk-artists, like Nicol Sayre, Lori Rudolph and Scott Smith, and goes there to take pictures and discover what new artist. 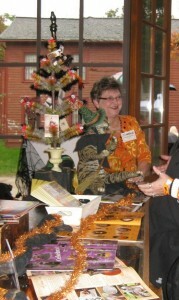 Last year we had a booth in the “General Store” where she sold copies of her Halloween edition of the magazine, past and present. We’ll be selling magazines again this year, but in a different location. 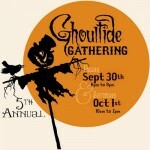 Because Ghoultide Gathering has become so popular, it has become a two day event! It is in Northville, Michigan September 30 and October 1. I hope to see you there! 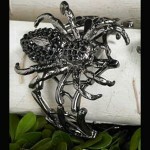 You will find a large selection of Halloween items in my store, including jewelry by John Wind, K&K, Debbee Thibault and Art by Amy. I will have some folk art and decorations arriving soon from Nicol Sayre, Elaine Roesle and others, so check back often!